Okay, so I have a "subtract health" function in my player controller. I want to call that function from the player character, so I have a variable in the character referencing the controller, and I'm trying to execute the function that way. For some reason, it isn't working even though I'm doing the exact same thing by referencing a function from the player character in the player controller, and that works just fine. 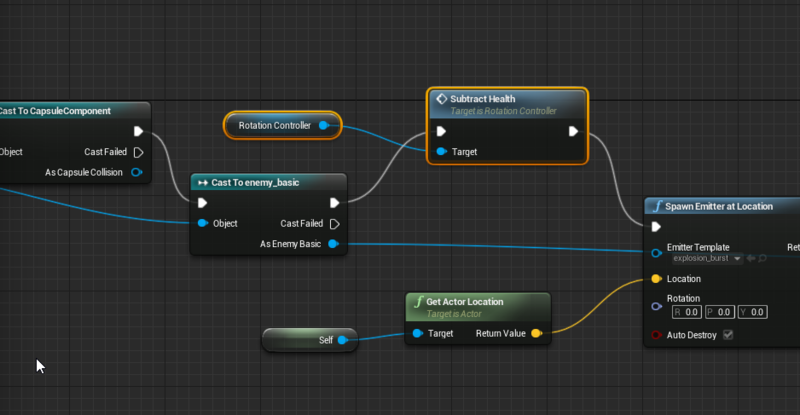 This is the rotation controller reference and the "subtract health" function. Everything before and after it works just fine, but the function (which right now just prints a string) does not fire at all. The function resides in the player controller and is set to public. Yes, the rotation controller is referencing the right object. Any ideas?